Swinging. He actually stuck this move. 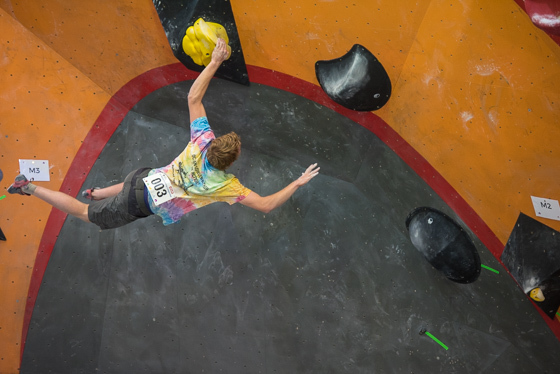 Samuel Healy (NSW) on the men’s open A finals problem #2. 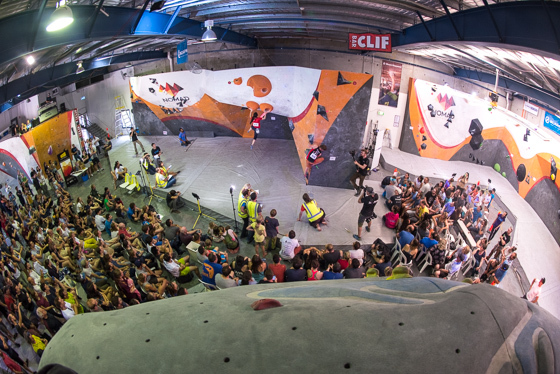 This weekend saw the Australian Bouldering Nationals held at Nomad Bouldering in Sydney. Long story short: wow, what a great event! Here are some pics from the Open A men’s and women’s finals. 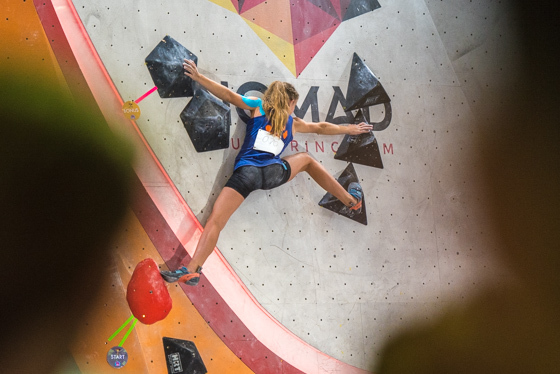 I wasn’t actually planning to shoot this event but my wife, Monique Forestier, had just flown back from a three and a half week climbing trip to Spain. In the end Monique had had a great trip away, overcoming an annoying back injury that flared up to succeed on her trip project — T1 Full Equip at Oliana — thus adding another grade 33 (8c) to her swag. 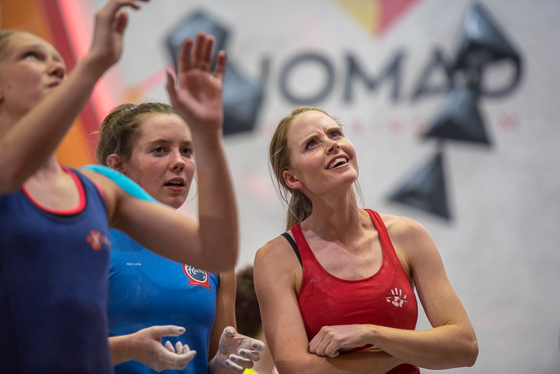 Now, Monique has also been coaching a lot lately, and she arrived back in Australia on Saturday morning and went straight from the airport to the Boulder Nationals for a coaching workshop that was being held in conjunction with the competition. Since our eight year old daughter, Coco, had not seen her mum in weeks, poor thing, I took her down to comp so we could all catch up. I could see it was an awesome comp so decided to return on Sunday to watch and shoot the finals. 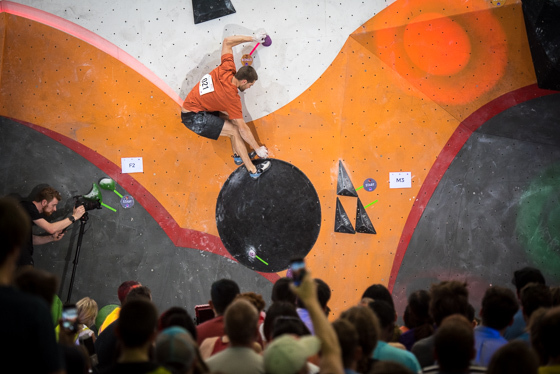 Climbing competitions have evolved a lot in Australia in the last 30 years. I can say that with some authority given that I actually competed in Australia’s first ever climbing competition — way back in 1989. 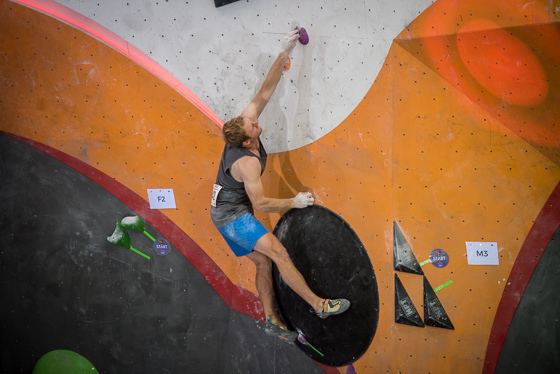 It was a lead climbing competition in Wollongong and somehow I managed to come second. Yeah I know, all that really is my age…. But I do remember that for the first few years after that competitions were just a whole load fun; more social gathering than anything else. Some years later things got a bit more serious (for some) but the time wasn’t really right for that and perhaps about 10 years ago the whole competition scene was kinda floundering, with some competitions struggling to get enough competitors. 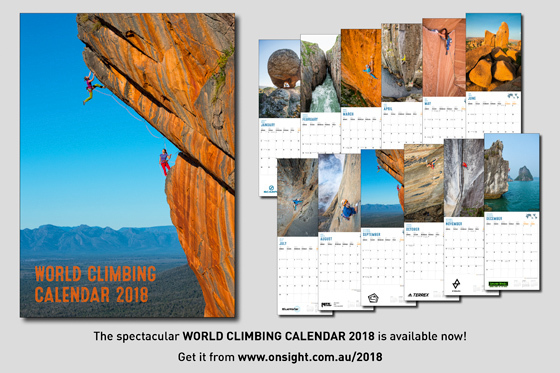 Obviously a lot of people have been involved in turning that around but none moreso than Carlie and Rob LeBreton who ran Sport Climbing Australia until relatively recently. 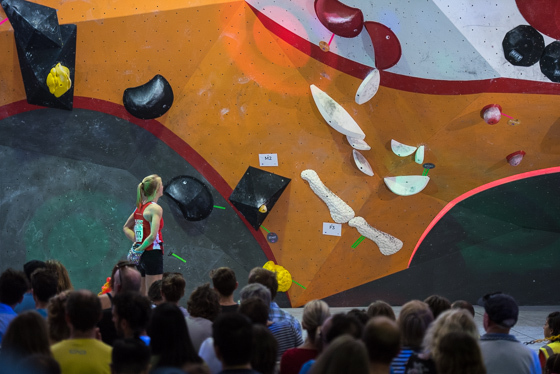 Add to that the recent explosion of indoor climbing and the proliferation of new climbing (especially bouldering) gyms and now climbing getting into the Olympics (in a fashion), and comp climbing seems to be taking off a bit in Australia at last. This weekend saw a very big – and very strong — field in both the men’s and women’s. The route setting appeared to me to be awesome and the event ran very smoothly. Congratulations to all involved in running this. And of course congrats to all the competitors who put on an amazing show. You can see the results –> here. I don’t shoot a lot of comps. Let me know if you enjoyed the pics. Tonde Katiyo, chewing screws. 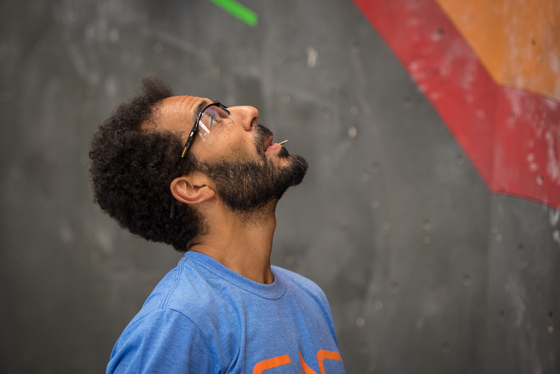 He flew in from the USA to be a special guest route setter. Thanks mate! Tommy Krauss was the head route setter. Great job all! Wot up? Roxy Perry (left) and Claire Kassey (right) preview one of the perplexing finals problems. 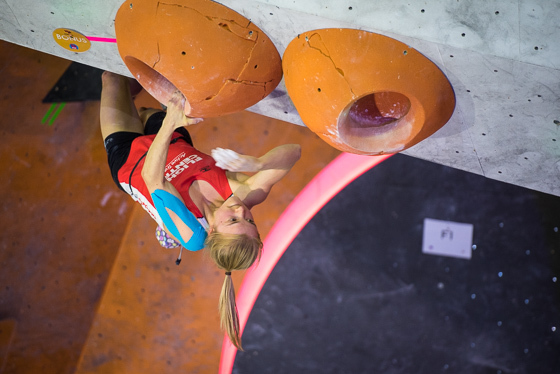 Lucy Stirling on problem #1. Claire Kassay, she likes to climb and bicycle. Parkour. 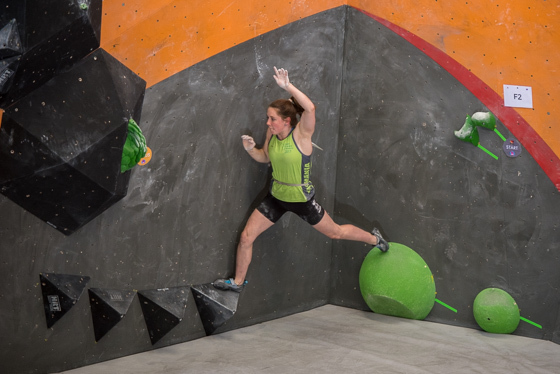 Roxy Perry (Tas) on problem #2. … then slab. Roxy again on problem #2. She finished in second place for the Australian women. Nails. Thomas Farrell (NSW) on his way to second place. No pressure but your time begins now… Lucy Stirling (Qld). She finished first out of the Australian women. Slopers and high heel hooks, a dicey combination. 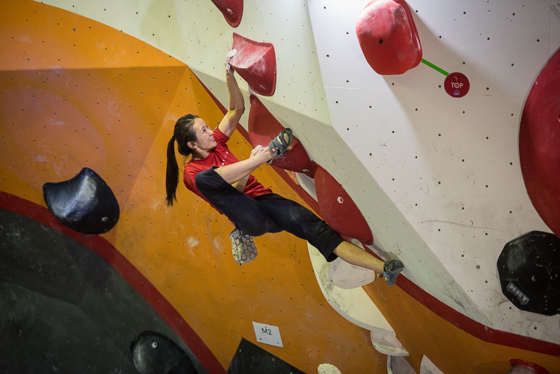 This is the amazing Liting Xu from Singapore, she won the women’s event but of course doesn’t get to take the title. Rockover triptych. 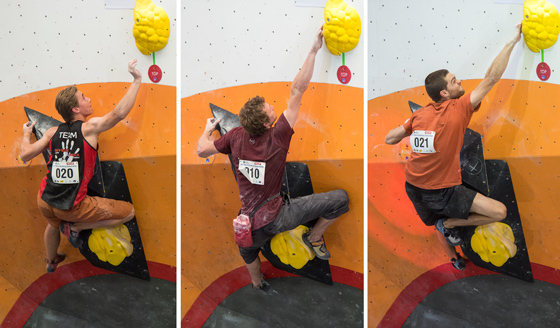 Ned Middlehurst (Vic), Sam Bowman (Qld) and Tom O’Halloran (NSW) battle the tricky finish to problem #2. Tom O’Halloran solving problem #3. 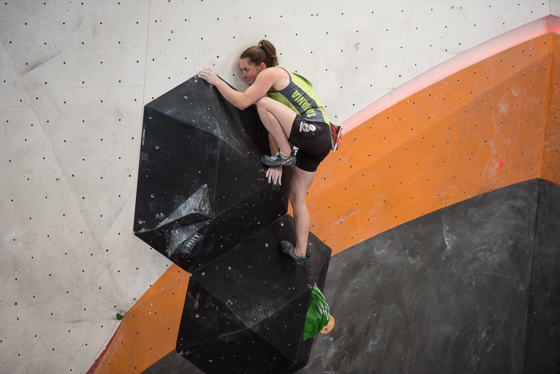 Leah Jefferies (NSW) in her first open competition. 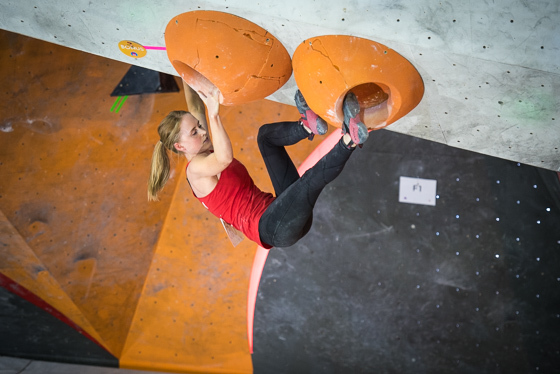 She’s only 14 and finished sixth (fifth Australian)! Patxi Usobiaga moment. 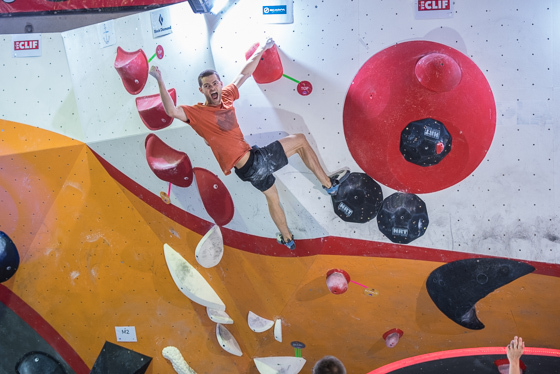 Tom O’Halloran happy to top the last problem for the win. And in other news…. 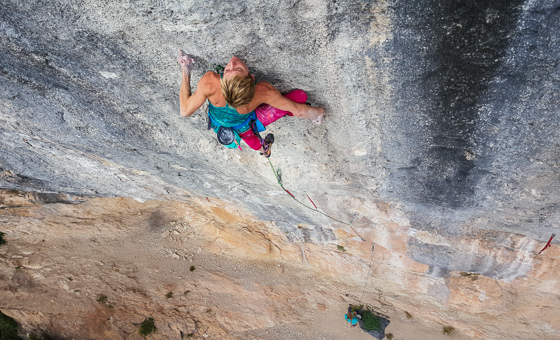 Monique Forestier on T1 Full Equip, the 8c (33) that she recently climbed at Oliana in Spain. Photo by Ofer Blutrich. Thanks to my sponsors: Prana, Sterling Rope and La Sportiva. Order here now (and stockists info). 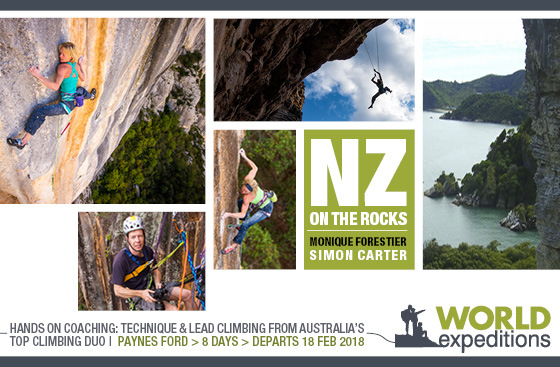 Up your skills with Monique and Simon in NZ! Info here. 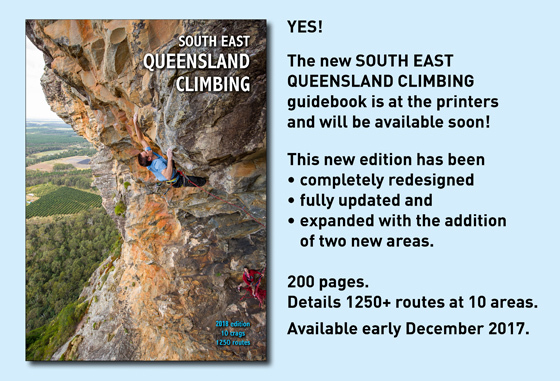 Preview and pre-order the new guidebook –> here.